On Friday a fierce cold came over me while I worked. My eyes weeped and my nose sneezed. As the day progressed, I felt so miserable that I skipped the Burns night dinner I had booked that evening – losing the chance to eat oaty haggis and creamy Cranachan. 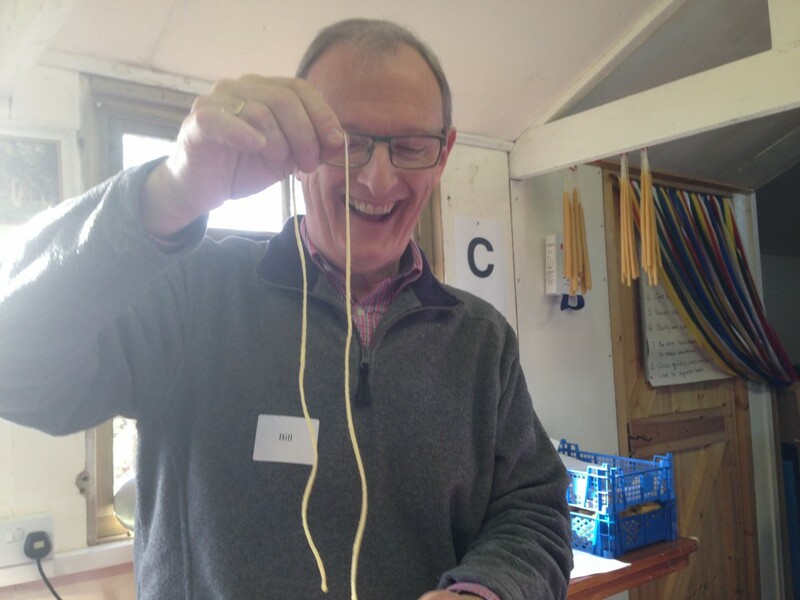 I feared I might have to miss Saturday’s Harrow Beekeepers wax workshop. Desperately trying to cure myself, I drank two lots of lemsip with honey from my hives and went to bed early. In the morning, I woke to find the wretched sniffing and sneezing had stopped. I can’t prove it was the honey, but I like to think it was. What a relief that I was able to go. 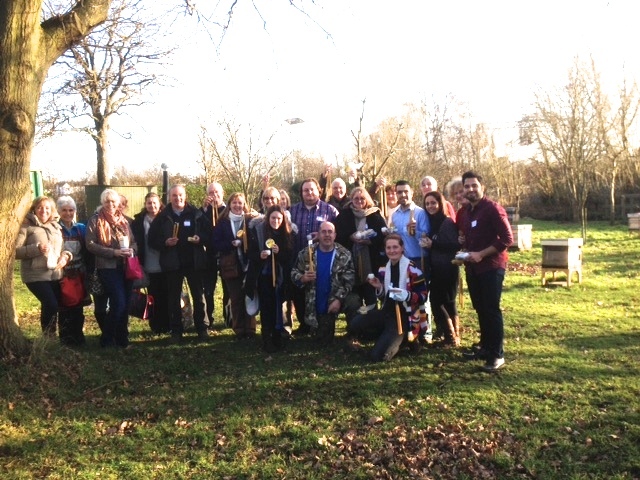 The Harrow association had put on a packed practical day of learning how to roll, dip and mould wax candles, plus make furniture polish, soap and hand cream. 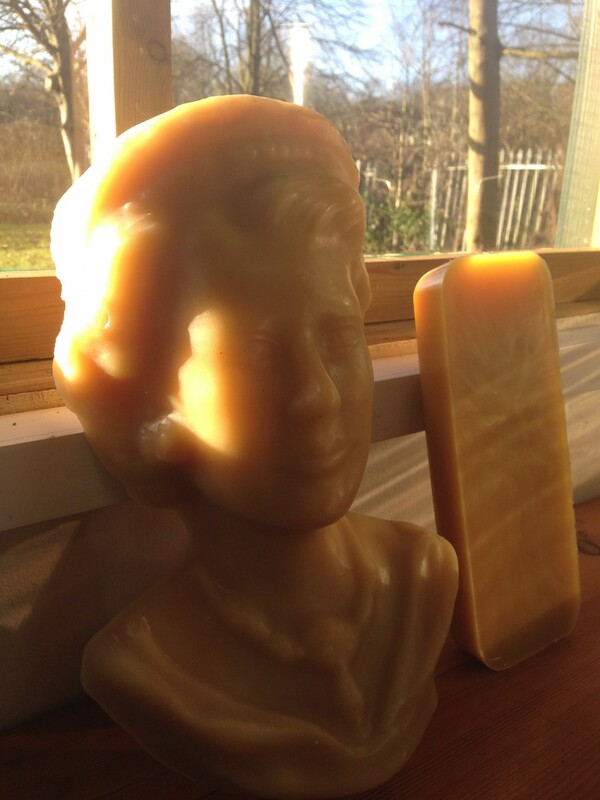 Wax is a valuable product that beekeepers, including myself, tend to underuse. It takes the bees a considerable amount of energy and effort to produce it, after all – we should value it just as much as honey. It’s excreted from the eight wax glands on the underside of bees’ abdomens, before being kneaded by the bee with its mandibles, adding a secretion from the mandibular glands. A worker bee needs about 4 minutes to complete the preparation of each tiny scale of wax, after which it can be moulded into place to form comb (Jürgen Tautz, The Buzz about Bees (2008). There were twenty of us doing the workshop, split into four groups of five. Each group took it in turn to do an activity with four instructors from Harrow. 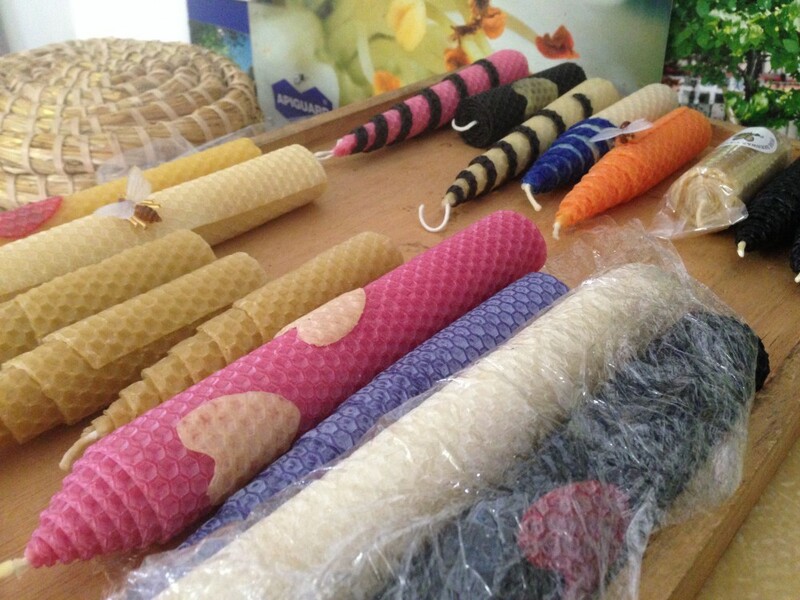 My group’s first class was candle rolling using wax foundation, taught by Doreen Pattenson. Doreen has a website at nascotwoodbees.co.uk and is on Twitter at @NWBees. Below you can see some of her expertly rolled candles. 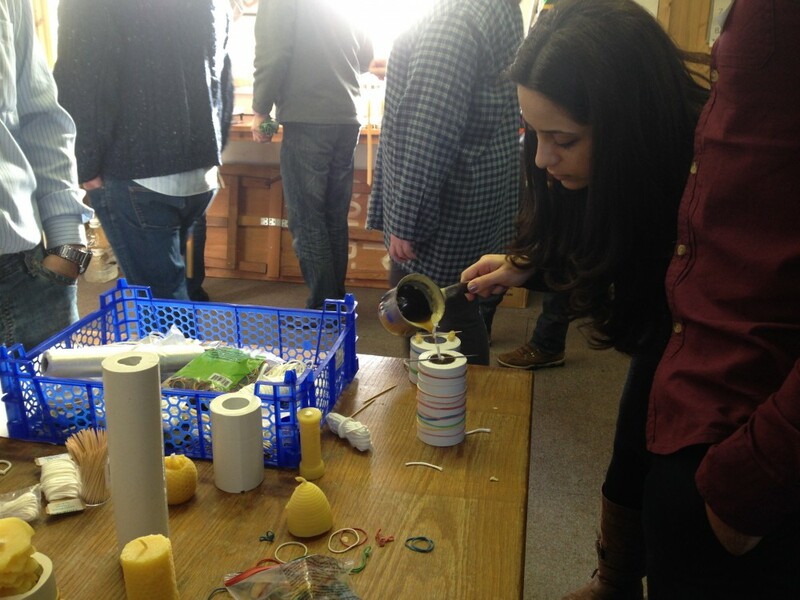 Doreen gave us lots of tips on candle rolling. One was not to do it on a cold day (like it was, being winter). 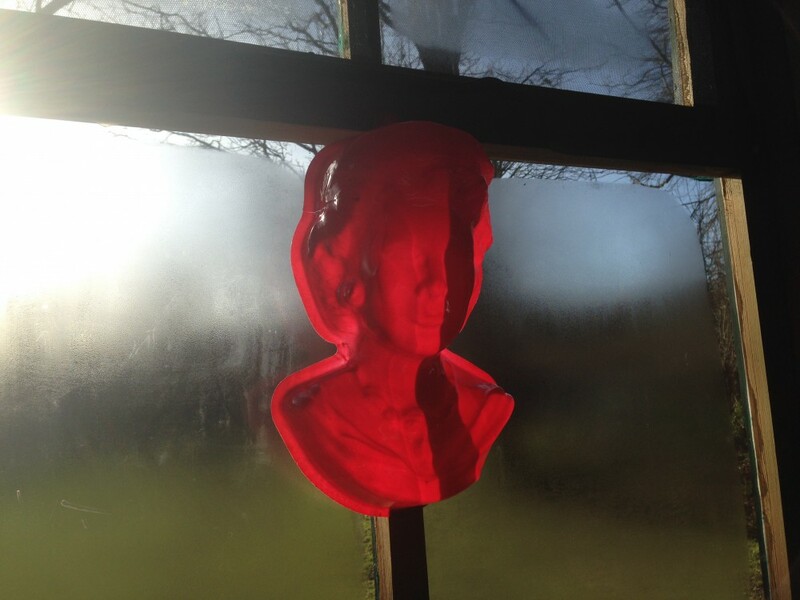 We had a bit of trouble with the wax as it gets quite brittle and cracks easily when cold. She buys her wax foundation from Thornes – thorne.co.uk/candlemaking – and also from kemble-bees.com, which she feels has the best quality wax. It should be unwired, of course. If you buy Langstroth frame sized foundation you get more for your money. 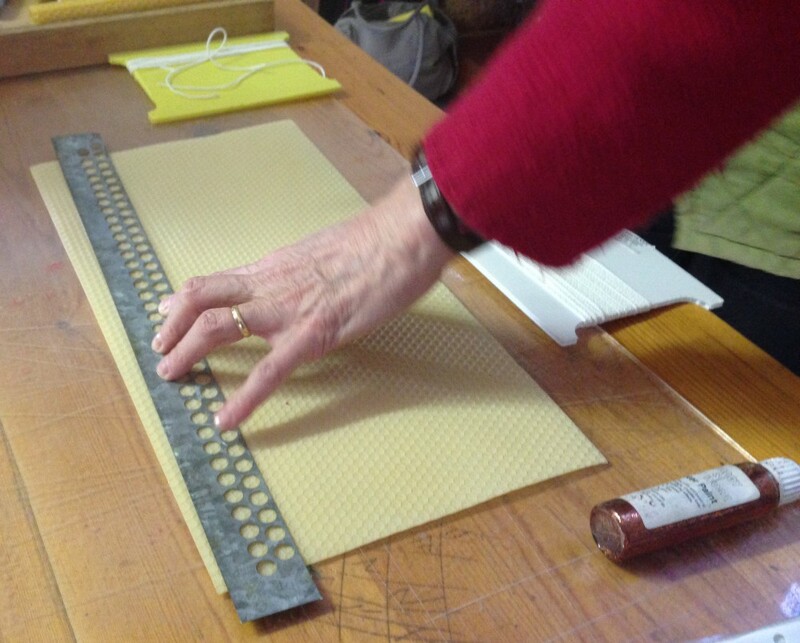 Below she is demonstrating cutting the wax at an angle to start the candle. Cut your wick to size and dip one end in molten wax. Lay the wick at one end and carefully wrap the foundation tightly around it, as tightly as you can. Keep rolling till you reach the end. The tighter you’ve rolled it, the longer it will burn. Doreen’s candles were extremely tight. To decorate her candles, Doreen uses cookie cutters to cut out different coloured wax shapes such as little hearts. She then presses these into the rolled candle. If reluctant to stay on, the shapes can be encouraged into place with a hairdryer. But do not overdo the hairdryer, as the candle wax may start to melt and lose its pattern. She also buys little plastic bee pins for extra prettiness. 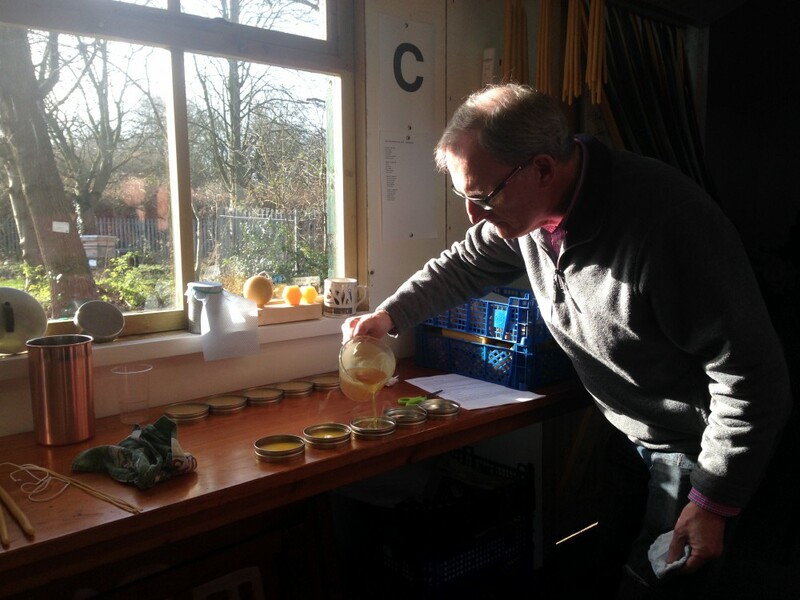 Next we went on to Bill Fitzmaurice, who demonstrated how to make beeswax polish in about ten seconds, followed by how to make dipped candles in considerably longer time. Prepare your candle wicks for dipping by straightening out the wick, pulling it down gently. You will need a long tall pot – Bill was using an asparagus boiler. Quickly lower the string into molten wax, then draw it out again, keeping it straight. Repeat until enough wax has built up to look like the examples below. This is how people made candles before they used moulds or rolled sheets of foundation. Bill has a winning lady. Here she is in pink. And here she is in yellow. Smooth and immaculately turned out, yet hefty and capable of giving someone a good whack. Cheaper than the real thing too, as she doesn’t require a palace to live in or a pack of corgis. When we stopped for lunch, the bees were busy revelling in the sunshine. Water seemed to be on their minds, probably to dilute honey stores. Harrow have about twenty hives in their apiary, so we had no shortage of curious visitors. Lucky they didn’t know what we were up to with their precious wax. 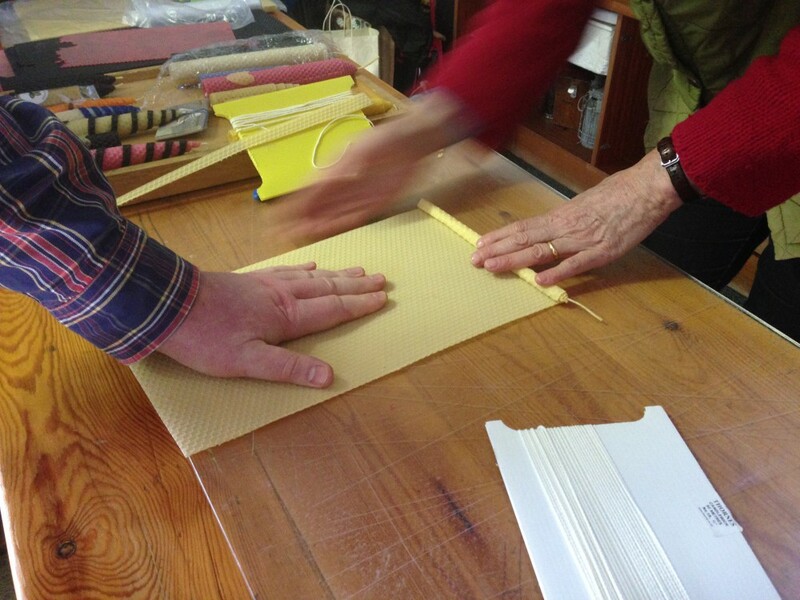 After lunch we had a candle moulding class with Jo Telfer. 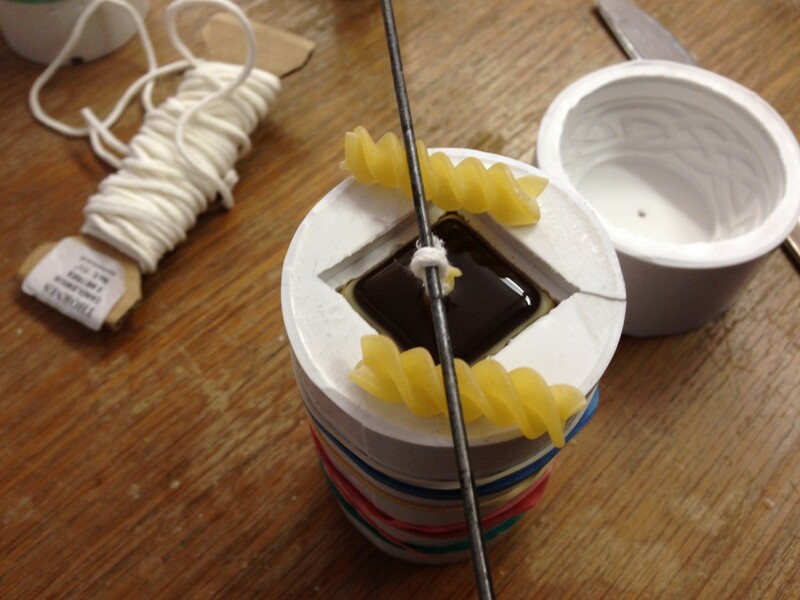 Jo has a clever trick involving pasta to hold the wick away from the wax when you pour it in. Below is my phone box candle. And here’s Harrow beekeeper Nabaa pouring wax into her mould. She did the workshop last year and was taking it again because she enjoyed it so much last time. Finally the last class was with Judy Earl, whose immaculate wax creations have featured on this blog before. No photos from this class, as Judy kept us busy measuring out ingredients and stirring them together to produce delicious smelling cold process soap and hand cream. Goggles and gloves were required. EDIT: See my hive partner Emma’s post ‘A beeswax and lavender butter‘ for a lovely moisturising butter recipe which is easy to make at home. 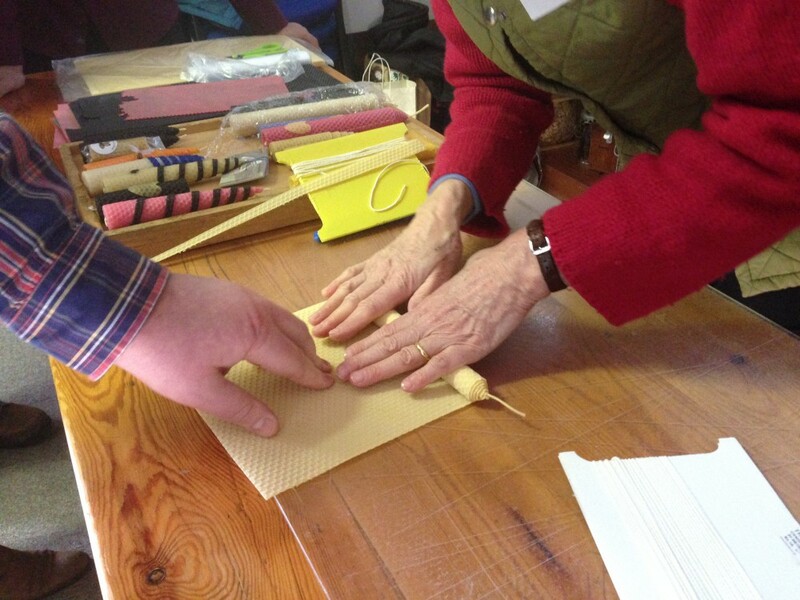 EDIT 2: Helen Worwood from Epsom Beekeepers has also written a blog post on the workshop, ‘Beeswax treasure‘, with lots of photos of the day and especially the soap making process. This entry was posted in Events and tagged wax. Bookmark the permalink. They are indeed, very friendly and good at sharing their knowledge. Thanks for such a great account of the day, Emily. It’s always a pleasure to work with wax, and especially with such an enthusiastic group! Another is planned for July-ish! Thanks Bill. I’ve let Emma know that there’ll be another around July, she’s very keen to go. Emma’s on my list for the next one – could you ask her to drop me an e-mail and I’ll let her know as soon as we’ve set a date. Great stuff! I love those rolled candles! Me too, they’re so bright and cheery. A nice suite of beeswax products all in one day. 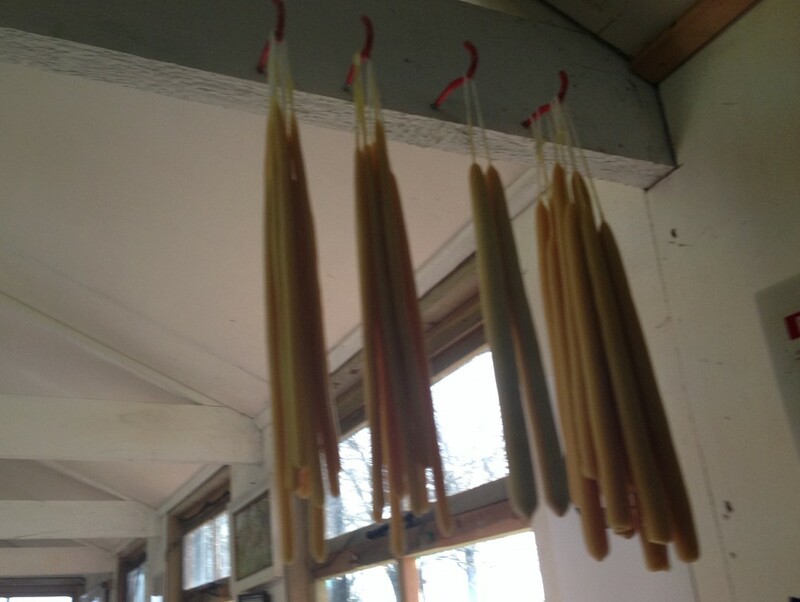 I made poured candles with most of mine this winter. I want to try dipped candles some time. A lady in our association uses a piece of iron pipe with the end capped to hold the wax in the water pot. It’s very tall and narrow so there isn’t a great volume required. The dipped candles would make a good table centrepiece. They do take more patience than the poured candles! Awesome post. Question: does the wax also carry the ‘flavor’ (scent) of the flowers the bees bees visit, much like honey has distinct flavors? At first I thought it shouldn’t, but then I was not sure. I suppose if one buy already processed wax, it probably undergoes treatments to either add or remove scents. Just wondering.
. . . also, the contribution of rest and sleep (helping the body’s own capacity to heal) tend to get ignored when one feels better. Myself, when I feel bad, eat a Nutella sandwich, go to bed early, and usually feel better in the morning. I always keep a couple of Nutella jars handy. Good question. The wax has quite a wholesome smell and I can’t tell the difference in smell between wax from different hives. It doesn’t carry the scent of flowers, just of the hive. The bees do need to eat plenty of nectar to produce the wax, but as the nectar is processed by their bodies the resulting wax doesn’t seem to smell of any particular flowers. I’m sure you’re right and the sleep was very helpful too. Most days I get up at 5.45am for work, so I was lucky that yesterday was a lie-in in comparison. Love the Nutella idea! Yes, Bill was using an old asparagus pot, it had a little picture of asparagus painted on the outside. Very interesting – what a rewarding day. Glad I found this unread in my inbox! RH ps I hadn’t noticed your neat subtitle before – ‘beekeeping bumbles’, indeed! Thanks! And there are so many bumbles! That looks like a really interesting and satisfying day. When I was at school, I had a Saturday job in a factory which churned out ‘hand-made’ crafts (Yes, I know. To be fair, we mostly finished and packaged them, they were mostly hand-made by part-workers in the local villages). By far my favourite job was dipping candles. Don’t think they had any beeswax in them though. One query – where are the photos of gorgeous cakes – these being a bee-keepers course, I’m sure there were plenty on hand. Sounds like an intriguing job. Wonder what was in those candles. Shockingly, we had no cakes at the Harrow workshop – though there were copious amounts of biscuits and cookies. It was mostly pretty boring work to be honest. 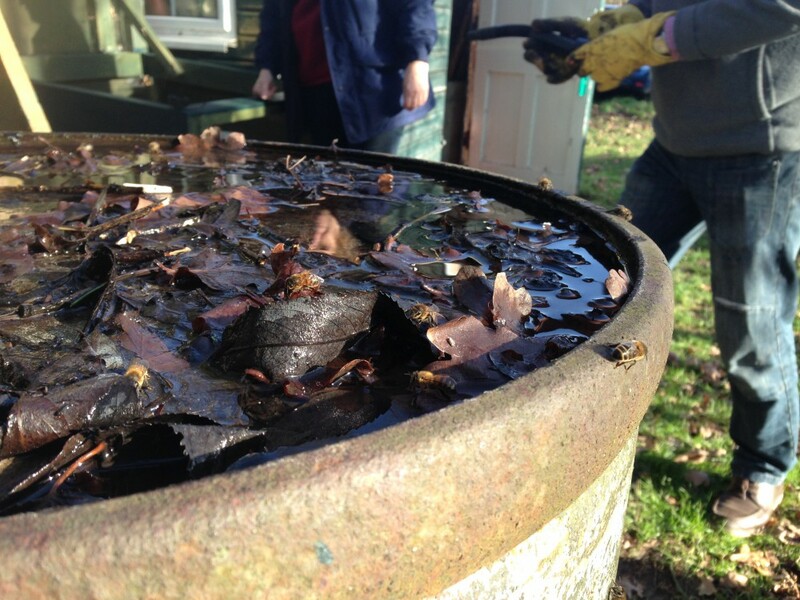 No cakes – proof, if it were needed – that standards are slipping, even amongst bee-keepers, which is a worrying sign. Biscuits and cookies don’t really cut the mustard by comparison surely. Well, we weren’t at the Ealing association! Our food is the best you know. I had been planning to make a cake, but the evil cold put a stop to that. OK, everything is clear. Shall I expect normal service to resume for future bee-keeping events? I can really imagine bee-keepers rushing to join the condemnation of sugar in all its forms which seems to be the latest craze.